Laske pulls together a lot of theories to do with adult development, from Bhaskar to Basseches, Piaget and so on, and relates it to adult development. He uses it to understand other models, such as Jaques’ models to with organisational hierarchy; Wilber’s model to do with development, but his main themes are that adults develop beyond Piaget’s limit of 21 (or 25) years right up to death. There are identifiable stages of development and measurable. Laske differentiates himself from Kegan as he separates out, but recognises the connection between social-emotional and cognitive. His criticism therefore of Kegan is that his view of the world is limited due to his lack of dialectical thinking. So he majors on the need for dialectical thinking as a core element of dialectical thinking. So then Kegan majors on social-emotional development. He looks at a person’s sense of self in the context of society or organisation. But he misses out, according to Laske, the hidden dimension of dialectics. Piaget, although foundational in his thinking said development ends after adolescence. He failed to see that development continues throughout life because he failed to understand the need for dialectical thinking by virtue of his methods of observation and logic. Dialectics is about what is missing but has to be there in order for the present to pertain. It is an holistic way of considering how thinking creates the world and allows us to interact with the world. This takes us back to Korzybski, who said we basically never interact with the real world. Through the IC, we think we can find a simplistic measure of how people think, which begs the question: does this relate to their level of (adult) development? Maslow, Jaques, Korzybski, etc, all looked at the whole of life, and they looked at the positivist view that says there is nothing added. We don’t have to add anything, there is simply nothing taken away in order to be balanced and successful. Laske is saying there is some need for addition, and that is the addition of complexity. We have to transcend and include. Kegan says we have to move our Subjective experience to Objective analysis, which Laske endorses. So now we have the core of what the IC is about, and the core of what I am trying to do with the students is to bring their subjective experience into objective awareness, and then raise the question: does this give them any advantage? Does it help us to analyse, via the Identity Compass, how they are operating in the world by understand what their subjective experience of the world? Laske calls this their Epistemic Stance. This is their way of being in the world, that includes SE and C, but also the Needs/Press, which is the felt pressure of society, or their organisation. This now links to the social-constructivist perspective. We are demonstrating synthesis as we pull together all the ideas above, and show how they are all true, yet missing an important element. Wilber tried to do this but he missed out dialectical thinking. 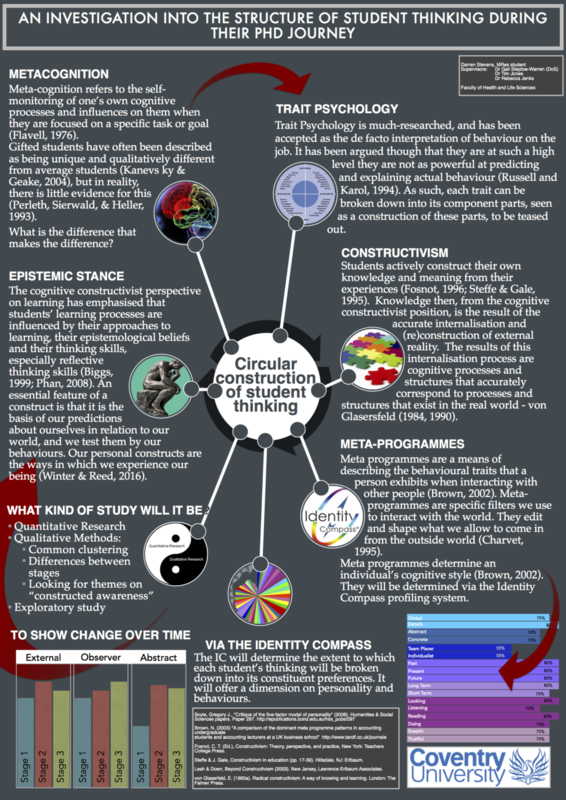 So now I am asking how does dialectical thinking relate to the Identity Compass? Well, maybe it doesn’t. Maybe the IC only measures up to the end of logic. If we can elicit meta-programmes from behaviour, and thus behaviour is the evidence of a meta-programme, we can map them to levels of development and determine if the behaviour is a choice or not. Is the behaviour a result of choice, or an unconscious bias? Can we influence this? How do we influence this? Is it appropriate to influence it in the context of academia? What if the supervisor’s unconscious biases, as a result of their embeddedness in academia, are in conflict with their students’ unconscious biases? And here is another way of looking at it. Notice how, over time, the story changes.